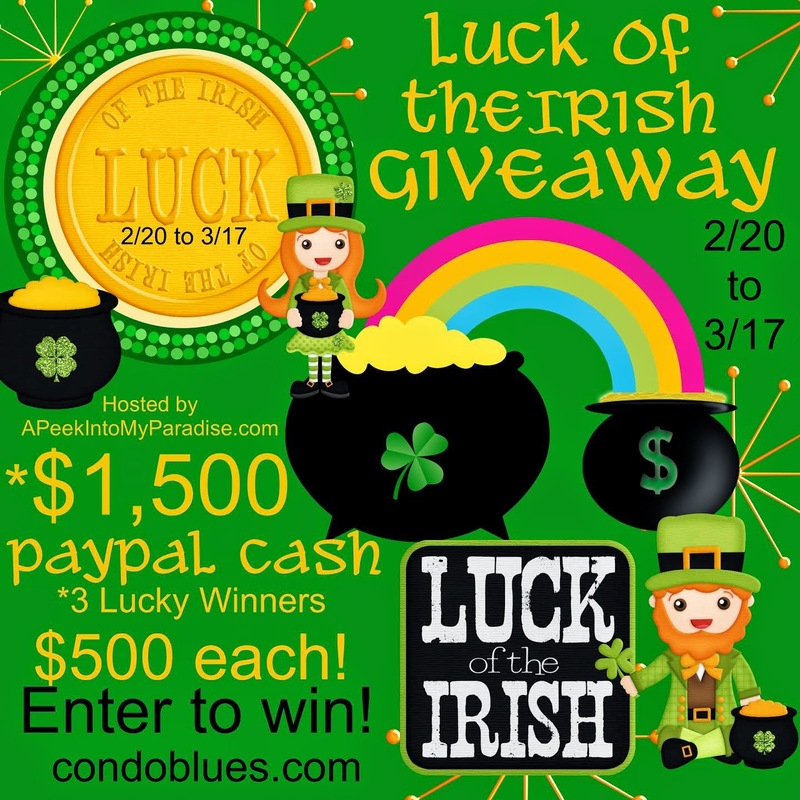 Condo Blues: Luck of the Irish $1,500 Paypal Cash Giveaway! Luck of the Irish $1,500 Paypal Cash Giveaway! I'm always looking for ways to thank you for being The Most Awesome Community on Planet Earth. Unfortunately, I can't do it in person or by anonymously shoveling your driveway (especially for you Australian readers. You are having as hot a summer as we are having as cold a winter, I'd love to personally visit you to thaw out say hello) but I can thank you with a giveaway of something that always fits - cold, hard, Paypal cash. $500 dolla, dolla bills to be exact! I'd love it if a Condo Blues reader won this giveaway! "May your pockets be heavy...."
the chance to "make your pockets heavy"
Please be sure and thank the team of amazing bloggers who joined me to offer this phenomenal cash prize! I encourage you to hop over and take a peek into their paradise! May good luck pursue you each day and night! Happy St. Patrick's Day from all of us to you! Three entries will be drawn for $500 PayPal Cash to each of the three winners. Giveaway will run from February 20, 12AM PDT Time to March 17, 11:59PM SDT. Make a Play Workbench for Your Little DIYer!